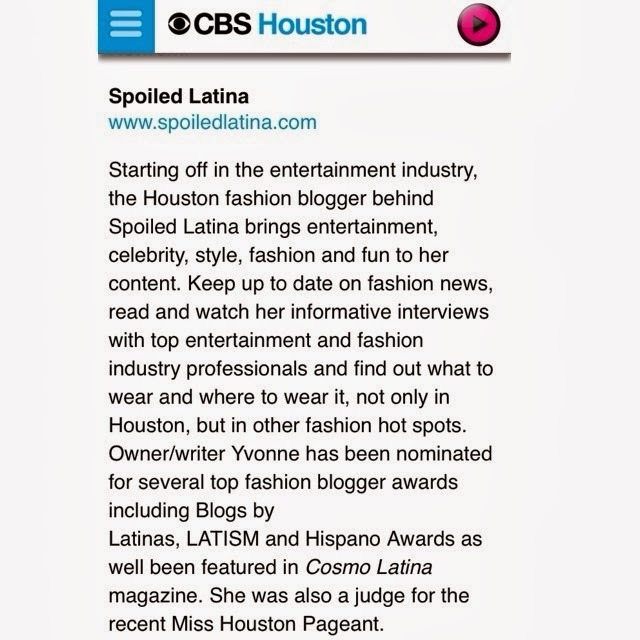 SpoiledLatina.com was Named One of the Top Fashion Blogs in Houston!! Earlier last week CBS Houston posted an article listing the top fashion blogs in Houston. We are so excited that SpoiledLatina.com was a part of this list. We put a lot of work into our blog posts and always try to offer our #SpoiledOnes the best experience. I have been lucky enough to witness the success of Yvonne's vision and her constant search for material spoiled enough for y'all! As her assistant, I couldn't be happier to work for such an amazing blog and boss. We are so happy to have our efforts recognized on such a grand scale. But, of course, NONE of this would be possible without your support of the #SpoiledLatina lifestyle. Thank you #SpoiledOnes for making this possible!